Pelican Cove 5 - Condo 2 Bedroom /2 Bath beach side, maximum occupancy of 5 people. 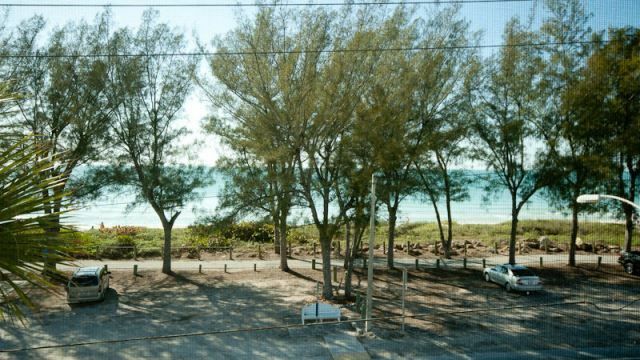 Pelican Cove 5 - Across the street from the beach- Condo 2 Bedroom /2 Bath beach side, maximum occupancy of 5 people. Located near the shops and restaurants on Bridge Street, Pelican Cove lures those who appreciate a lively vacation. Start your day with a game of tennis, swim your laps, jog on the white sand beaches, or grab fins and mask for snorkeling. At the end of the day, consider the hot tub or perhaps if you are docking your boat here, you may want to consider taking it out to the Gulf of Mexico. Come to play on Anna Maria, come to Pelican Cove. This condo has a new flat screen 42 inch living room TVwith HD! We live in Bradenton and love the beach. Awesome location and great for boating. You can park your car and walk or ride the trolley to most places on the island. This is a great condo if you're a boater. We also frequently walk or bike the trail out front. You can visit Leffis Key to walk the beautiful nature trails which is only about 1/4 mile down the road. For you Moose members, the beachfront Moose lodge is within walking distance! The rental was perfect for our family of 5. highly recommend this property! We had an amazing week! Perfect family vacation spot! Great view of the ocean from the front balcony. Beach was a little crowded but it was July 4th week so that was expected! Definitely loved our visit to the island! The views of the sunrise and sunset were amazing. The condo is very comfortable and well appointed. It is a perfect location on the Island. We will definetely stay here on our next trip to Anna Maria. Thank you for all your wonderful words. It warms our hearts to know that others love the Island as much as we do and we're so happy that your family was able to enjoy both the sunrise and sunsets too. Please do not hesitate to let me know if I can help again in the future and thanks again for taking the time to leave a review. We (two couples, early 60's) spent the month of February in the rental unit, and wondered in advance if 4 weeks might be too much time in one place. No problem! We have nowhere near exhausted our list of things to see, do, and do again. The condo was a nice size for us, and the well-equipped kitchen allowed us to minimize expenses by making about half our meals in. This took great restraint, since there are SO MANY good places to eat on the island and nearby. In terms of activities, it didn't hurt that we had mostly fantastic weather. Having the beach right across the street was great fun. And we have some terrific sunset photos. We caught some great free music evenings on nearby Bridge Street, and the market on Sundays. We fished off the bay dock, as well as all the town piers, and watched dolphins chasing mullet at dusk. The Cortez Village Fishing Festival was a hoot, as was our (successful) half day party boat excursion out of Sarasota. You just can't get tired of fresh fish! Having the rest of the island easily accessible, and Longboat Key nearby, always gave us lots of options. Would definitely recommend both the Mote Aquarium and associated eco boat trip. Some more offbeat visits included the wintering Lipizzaner Stallions in Myakka City, and the big cats show in Sarasota. We were glad we brought our bikes along, since there are so many lovely places to ride, and a bike trail right across the street. We also made good use of the pool and jacuzzi, and had a chance to meet condo neighbors there. AMI really is a treasure. In the interest of full disclosure, I would remind readers that there is no elevator, so be prepared to walk up with your bags and groceries. Also, there is some traffic congestion northbound (from Longboat?) certain times of the day, so plan ahead, or zoom by on your bike! Although we didn't use it much, there is a stop nearby for the free trolley/bus. One last thing: the rental agents were fantastic; attentive but not at all intrusive. We have already recommended this place to others, and will keep it on our short list when we return to Florida. Wow. Thank you for taking all this time to write such a wonderful review and the details of our great Island are phenomenal. You have chosen many of the places that we love to enjoy too and I'm glad that you were able to take full advantage of all there is to offer. Please let me know if I may be of any further assistance in the future as we'd love to have you back. $90 cleaning fee, reservation fee $35 and 11.5% tax.